The LA Lakers playing at Staples Arena. The second leg of our fall sportscation brought us to the mega-metropolis of Los Angeles. Wayne and I are very familiar with the area because we lived here in the suburbs. I was born and raised in nearby Compton and Wayne came to Los Angeles in the early 1970s to attend graduate school at the University of Southern California. That's why he is such an avid USC fan. My dad went there as well for graduate school, so I can root for the home team as well. USC men's basketball vs. Northridge. Our choice of Southern California as a sportscation destination had two purposes: one was to attend USC sporting events, the other was to get some sunshine and warmth. We love our float cabin home on Powell Lake in British Columbia, but a break from short cloudy days is welcome this time of year. Plus, our tans are starting to fade. This trip began with USC football at the University of Oregon, then followed the team home to LA. We drove to Eugene, but left our car at the airport and caught an Allegiant flight direct to LAX. We rented a car and headed to the Raddison next to the USC campus. This hotel gave us easy walking or Metro Rail access to all the sports venues. Our Hotel Travelling Meal Kit packed to go. Because we were staying in a hotel for an extended period of time, we brought along our traveling meal kit. We stopped at Ralph's on the way out of the airport area and purchase breakfast and dinner items for the first four days. I keep a log of which hotels have refrigerators and microwave ovens. If there's no refrigerator we use our folding cooler bag. If there's no microwave, we purchase deli meals that don't need cooking. Check it out here. USC vs. UCLA women's volleyball game. The USC vs. UCLA football game wasn't until the following Saturday, so we used the week in between to watch other sports: USC men's basketball, USC women's volleyball (they won the Pac-12 title), a Laker's professional basketball home game at Staples, and the exciting USC pre-game Bonfire Rally on campus. We also drove to Lancaster to visit Carl and Lori, friends from Wayne's teaching days at Mt. San Antonio College. Lori made us a scrumptious Thanksgiving dinner with all the trimmings! And we spent the night getting caught up since our visit last year. We are thankful to have such good friends. USC Trojan football at the LA Coliseum. Finally, it was Saturday and time for the USC vs. UCLA football game. We walked over to the Coliseum (home to the 1932 and 1984 Olympics), missing all the traffic and parking headaches. A 40 to 21 win by USC was the perfect culmination to a week long sportscation with the added bonus of some fun in the sun. Cities have parks for public recreation, relaxation, and entertainment. These urban oases draw residents and tourists alike to enjoy the outdoors. In downtown Los Angeles, Exposition Park has beautiful grounds with lawns, museums, sports venues, and a lovely rose garden. The Exposition Park Rose Garden was created in 1928 and is maintained by the Los Angeles City Department of Recreation and Parks. While Wayne and I were on our Los Angeles sportscation, we took an afternoon off to enjoy the lovely garden and spend some quiet time reading in the glorious, warm sunshine. Do you remember high school or college days and the high spirits prior to a game with your main rival? Do you remember pranks involving mascots? The crosstown rivalry between USC (University of Southern California) and UCLA (University of California Los Angeles) has been front and center since 1916. Because the campuses are only twelve miles apart there's lots of opportunities for hi-jinks. We're staying at the Raddison on the USC campus for the second leg of our sportscation. It's perfect for us to walk to all sports venues. It's also next to the Metro light-rail "Expo" line to downtown Los Angeles and the Staples and the Convention Centers. But back to rivalries. During Conquest Week, the mascot statues are covered for protection. Here are before and after pictures. 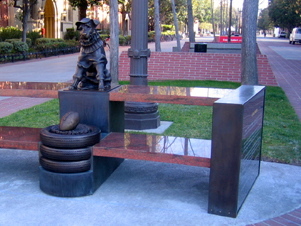 First comes George Tirebiter, a stray dog that became an unofficial mascot that led the USC Marching Band into football games in the 1940s. George Tirebiter, a 1940s mascot. George "in the doghouse" for safety. Next comes Traveller, the white horse that has galloped in the football stadium carrying a Trojan warrior at home games since 1961. During Conquest week, Traveller gets wrapped in duct tape to keep him safe from UCLA Bruins fans. Finally comes Tommy Trojan. He represents the spirit of USC. He also gets covered in duct tape so he doesn't end up with a coat of blue and gold paint in the dead of night. In addition to the protective coverings, the mascot statues are guarded 24-7 by representatives of the Trojan Knights philanthropic and school support group. Last night there was a Bonfire Rally on the USC campus. It was closed to outsiders, but we watched from outside the fence. First came team introductions with the USC Marching Band and Song Girls. Then it was time to light the bonfire. When we walked through the campus earlier in the day we saw the bonfire pile and Bruin effigy that would go up in flames. Do you like to watch sports? High school? College? Professional? Why not combine that interest with your vacation plans. Games can be the main purpose of your trip, or an adjunct activity. Either way, taking a sportscation is a fun way to travel. Wayne and I drove to Eugene, Oregon for the first leg of our fall sportscation. We come here for lots of USC sporting events at the University of Oregon. We checked in at the downtown Eugene Hilton. We like to stay here because it's within walking distance to Autzen Stadium for football, Matthew Knight Arena for basketball and volleyball, and the new Jane Sanders softball stadium that will open in 2016. We timed our arrival to watch a women's volleyball game. We're USC fans, but enjoy watching other teams when SC isn't playing. The Oregon women faced off against Washington, but weren't able to win over the No. 2 ranked Huskies despite an initial win in the first set. Volleyball is a new sport for us, and for this game we got excellent seats right up front and even with the net. Several years ago we discovered a great breakfast spot, The Original Pancake House, and had to return on our way to the USC vs. Oregon football game the next morning. There wan't time for us to get their signature Dutch Baby Apple Pancake, but anything at this popular Ducks hangout is great. Plus, it's right on the way to Autzen Stadium. Walking to the game is much easier (for us) than trying to battle the crowded streets and park. To work off our breakfast and get to the game, we walked along the Ruth Bascom Riverbank Trail. This popular riverside path follows along on both sides of Willamette River as it meanders through town. You can use the dedicated foot bridges and make it a two mile or so loop. Parts are paved to share with bikes, and parts are dirt along the north shore. One branch will take you right to the front of Autzen Stadium. Just follow the crowd. Finally to the main event, the USC Football portion of our trip. We took our Coleman portable stadium seats and it was a good thing we did. We were on the shady side and the benches were still wet and cold from rain and dew the previous night. Wayne picked these stadium seats because they are light weight, roll up fairly compact, and are easy to pack in a suitcase for our sportscation trips. Because we were on the shady side, it was was a lot colder than the sunny side. Even with my sweatshirt, jacket, and gloves I was chilly. At half time, I went downstairs to warm up in the sunshine and get a Dutch Bros. hot cocoa. After a good warming, I went back to the game, but USC was a bit cold as well. They lost to the Ducks 48 to 28. Seems like we didn't bring them enough Canadian luck. had the Saturday special, a hot meatball sandwich, fries and a brew for only $12.99. Good food, USC and Ducks fans (getting along), and a funky atmosphere. at least on the south side of Burrard Inlet. When we arrived, the wind and tide were in opposition causing huge standing waves that were visible from the Ironworkers Memorial Second Narrows Bridge. But by the time Wayne and Bill were ready to sail, the wind had reduced to a light breeze in the Port Moody area, perfect for a first lesson. I've been rediscovering some of my Mom's old cookbooks. One is Rival's Crockpot Cooking. Her cookbook and crockpot are from 1975, but they both still work very well. You can still find new and used copies at Amazon.com for a reasonable price. I slightly modified the recipe for Crockpot Stew on page 26 for an easy one-pot meal. Combine 1/3 cup flour, salt, and pepper. Instead of regular salt and pepper I used a combination of seasoned salt, garlic salts and lemon pepper. Coat cubed round steak in the flour and quickly brown in oil. Place the beef in the crockpot and stir in any remaining seasoned flour. Add all vegetables except for the frozen peas and mix well. Combine beef broth (I used one cup of water and a beef bullion cube), wine and Worcestershire sauce (I didn't have the Kitchen Bouquet the recipe called for). Pour over the meat and vegetables and stir carefully. Cover and cook on low for 10-14 hours (or on high for 4 to 5 1/2 hours). One hour before serving turn to high setting and add frozen peas. Make a smooth paste of 1/4 cup flour and the water. Stir into the Crockpot, cover and cook until thickened. I added additional water at this point to make the gravy a bit thinner. That's they way we like it. I made some easy Bisquick biscuits and we had a hearty dinner for a cool rainy evening. Wayne loves to write, I love to read. It makes for a good match. I like reading about BC to learn more about the area. There are lots of book stores and stores that sell books in Powell River to feed my habit. 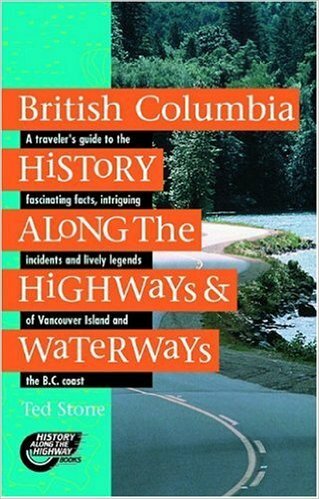 One is Coles Books (shameless plug - they also carry Wayne's Coastal BC Stories). They always have a bargain table and I never pass it up. Here's one of the treasures I found. 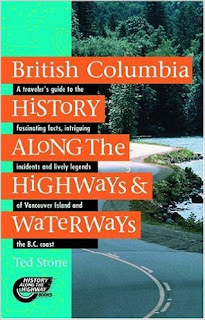 British Columbia History Along the Highways and Waterways by Ted Stone is "a traveler's guide to the facinating facts, intriguing incidents and lively legends of Vancouver Island and the British Columbia coast." You can find it used at Amazon.ca or Amazon.com if you can't find it in your local bookstore. The book is divided by regions: 1) Victoria and the South Island, 2) Vancouver and the Lower Fraser River, 3) Vancouver Island from Victoria to Cape Scott and 4) Coastal BC and the Queen Charlotte Islands. Each chapter begins with a brief history of the area and there are short vignettes about a historical fact, interesting person, place name or legend. Each describes a location you can reach by car (highway) or boat (waterway). We've had some cool weather here in Bellingham, so I decided to make a crockpot meal that would warm us up a bit, Swedish Cabbage Rolls. I used one of my old recipe books, Crockery Cookery by Mable Hoffman (Bantam Books, 1975). Immerse cabbage leaves in a large pot of boiling water for 3 minutes or until limp. Drain and remove the heavy center rib. Combine the tomato sauce, lemon juice, sugar and Worcestershire Sauce. Pour over cabbage rolls. Cover and cook on low for 7-9 hours. Makes 6 servings. Margy's adaptations: I added 1/2 teaspoon thyme to the meat mixture and 1/2 teaspoon Italian seasoning to the tomato sauce mixture. That may not be very "Swedish," but I like the taste. Do you have any favourite crock-pot recipes? On a recent trip to to the States, I headed to Historic Fairhaven just south of downtown Bellingham. There are lots of great restaurants, shops, bookstores, and in the summer months the farmer's market. My destination this time was the Eclipse Bookstore at 1104 11th Street (360-647-8165). It's one of my favourite used bookstores in the whole wide world! The Eclipse Bookstore has an amazing amount and variety of books covering the two floors of the establishment. Because it's a used bookstore, the prices are very reasonable. It takes tiptoes to see the volumes on the top shelves, but the easiest way to get to the bottom of things is to pull up a piece of carpet and settle yourself down on the floor. David, the proprietor, has arranged the books neatly on shelves by topic. Just ask and he will lead you to the section you desire. As you can see, there are so many books, some are in stacks next to the shelves patiently waiting their turn to get a coveted spot (if someone doesn't buy them first). You can't see all that the Eclipse Bookstore has to offer in one visit. Visit often and take your time to really enjoy the experience. I headed over to one of my regular spots, Canadian books. And I got a huge surprise. Up the Strait by Wayne J. Lutz at the Eclipse Bookstore. There in one of the stacks I found Wayne's book Up the Strait. I'm not sure how it made its way to this store (if only books could talk). 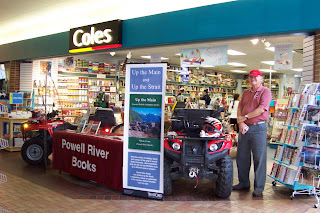 Up the Strait is a great book for boating enthusiasts. Here's some information if you'd like to take a look for yourself. It's cruising time again. Jump in the boat and head up the Strait of Georgia with us to magnificent anchorages and exciting adventures. Drop your hook in world famous Desolation Sound, discover hidden coves, and meet some of the locals. Read Up the Strait by Wayne Lutz and then join us for the cruise of a lifetime. You may never want to leave.